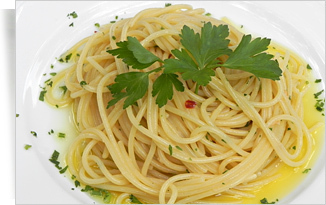 Boil the water using at least 1ltr of water per 100g of pasta used, do not put salt in the water yet. When the water has boiled add the pasta, stiring it with a large fork to stop the pasta sticking together. Add the salt and leave the pasta to cook. While the pasta cooks, put the EV olive oil in a saucepan.It is important to use the best olive oil, as this will significantly affect the taste. Add the garlic and chilies. Lightly fry for 3-4 minutes to infuse the oil with garlic and chili. To avoid the garlic and chili burning, take the pan off the flame. When the pasta is ready, drain, and add the olive oil sauce. Add the fresh parsely and stir well. Serve immediately.